store. And their 'Hamilton' tote is one of my favorites. Michael Kors' bold turquoise tote is a super chic way to tap the tonal trend. Luxe gold hardware and subtle structure lend this leather piece polish. 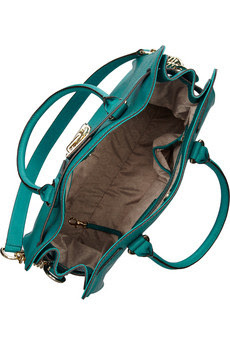 I love anything turquoise, definitely my fav colour by far but this bag is just darling!! I would take it in any hue!! This is a beautiful bag!!! I do like it in the cream color better, though. But the turquoise would be a great pop of color. Love it!